Dhima is a gruff and grumble yet slightly psychotic simian who lives by the "go ahead, make my day" philosophy. His face is scared up one side from a powder keg accident, yet he still smokes his cigars from that side. He wears a dirty, moth-ridden wide-brimmed hat with a set of dark lensed goggles on them (Goggles of Night), and a geometric-patterned rustic poncho. 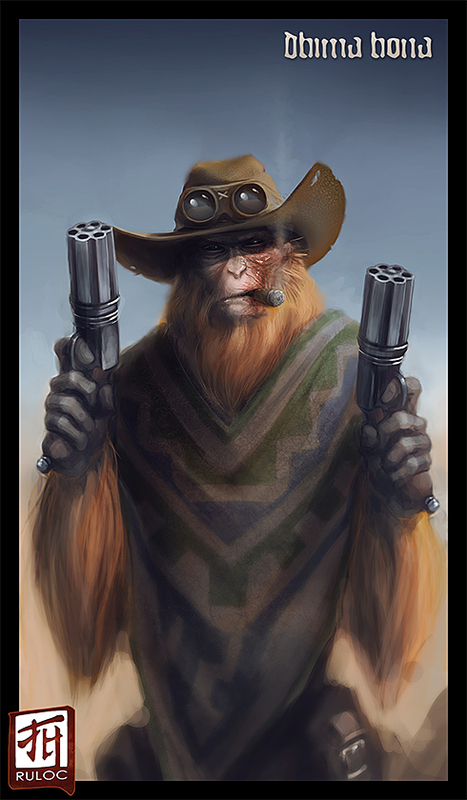 I see him as kind of a mix between Jonah hex and The Stranger from the Oddworld series, but, you know, a monkey. He dual-wields twin magical pepperboxes, that he rotates with his tail. Very Western Feel. I'd love to see him in a pose with both weapons drawn.